The final race this year was much harder than expectation when only 23 birds could return in day one from the total field of 1031 birds. We were lucky never had suffered a real bad weather day and much training losses, but this last official flight was a real test of stamina and courage. The temperature in Nongkai at 7.10 a.m. when the birds were released was around 23 Celsius but it rose quickly along with the sun en-route to Bangkok where thermometer hit 25-37 Celsius at noon till late afternoon. The last two hours flight was win-op-kop because the win changed direction coming from southwest direction. The first lone pigeon took almost nine hours to land on the antenna at 16.09.32 pm setting a speed of only 982.322 mpm., the lowest in our race history. The second bird was 24 minutes later and followed periodically by 22 more bids until darkness fell. Looking back to the final race of last year, the situation was like this year albeit not too the same degree. The first bird took 8 hours and 23 minutes cover the distance at 1051 mpm., and she was 20 minutes of the second bird. Only 33 birds arrived in one day from 607 birds competing. The situation in 2016 was not much better when only 28 birds from 650 made it in one day while the first two birds were 4 minutes apart but 34 minutes ahead of the next bird. Winning speed then was 1117.53 mpm. In the words of Mr. Jassim Alkulaib from Kuwait who every year brought in a few hundreds of pigeons from the Middle East, “TGPR is the world most difficult OLR and the best place to test the qualities of racing pigeons”. The winner of this year race was a small blue hen C18-100464 entered by the TNC Group Rayong. Like most if not all the early birds this year, her past records were nothing to speak about meaning there was a complete change of profile or type of birds that could stand up to the hard-final race. The fastest pigeons of previous races and training flights and top contenders for Ace Pigeon titles were not to be seen in the top tier either. This little Van Loon hen rewarded her owner with Euro 50,000 cash and the superior King Cup. TNC Rayong Group also won three more early prize in this race i.e., 8, 30 and 45. Last year, they won the first ACE pigeon and a big poll money. A Jan Hooyman’s Harry line Cha18-63016, entered by Chris-Chanachai-Chien combination won her 2nd prize by a speed of 939.87 mpm. The 3rd prize winner R18-55044 was four minutes after the second bird at 933.80 mpm. As predicted, the owner was no one else but Mr. Boonchuay who teamed up with Sant and Pichai. This team won 3rd prize in Hotspot1 and 1st prize in Hotspot 2 and was a strong contender for the Team Championship title. Fourth prize and the Queen Cup winner and first among foreign birds was a German bird wearing Dutch ring NL18-1358913. She was a red Jan Aarden hen which fetched a high price in the auction. 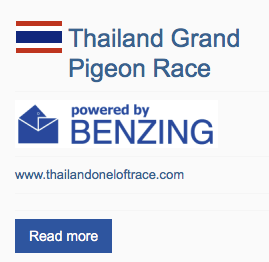 The next major competition was the Team Championship which offered the Princess Cup and Euro 5,000 for the winning team that could accumulate the highest number of prizes won within the first 15% of birds in each race in all three official races. The Blue Blood camp won the first and second prizes by two teams which scored equal number of 8 prizes each. The next three competing teams followed at 6 prizes each. They were the TNC Group Rayong, Sadawut Taecchaubol and Pod Kubon. The Blue Blood camp was very consistent in Ace bird completion and had always won a position within the first three places. They also won the second prize in final race of 2016 and 2nd prize in Hotspot 2 in 2017. Among the 1031 birds basketed for the final race, 533 were local birds and 498 foreign. Countries which had high numbers of basketed birds were Kuwait 108, Belgium 71, Netherlands 71, UK 67, Germany 57, China 24 and USA 19. There were 609 birds’ home after three days and 19 more when the clock was stop two days after, making the total of 628 home-comers. The rates of return among major participating countries were as follows: Thai 322/533=60.42%, Belgium 43/71=60.52%, China 17/24=70.84%, Germany 38/57=66.67%, Kuwait 58/108=53.71%, Netherlands 45/71= 63.33%, UK 46/67=68.66%, USA 12/19=60.42%. Ratio of total return/ total birds released 628/1031 = 60.92%. The above statistics revealed that local birds were not as good as foreign ones as a group but performed better in the top 25 positions. Year 2018 season had a record number of originally registered 2820 birds including those from many world famous names such as Hardy Kruger, Alfons Klaas, Gaston van de Wouwer, Kaier Loft, Great Wall,Freialdenhofen & Shone,Jose Thone Ganus FFamily Loft, Chis Hebberecht, and Jos Vercammen, just to name a few. It was our great pleasure to meet more than 200 people, local and visitors who braved the afternoon heat waiting for the arriving pigeons. The facility was not designed to entertain many more visitors, but it was probably the only place in the world that people can watch pigeons entering the loft from only 20-30 meters away. We had the opportunity to meet new friends and a few well-known figures in the pigeon world such as Sorin Florea from RO, Lex and Ingrid of GPS team not to mention about our usual supporters like Harrie van Boxmeer, Florian Hendriks, Jassim Alkulaib, Esther and Hugo Moris, etc. We apologize for the inconvenience regarding the hotel reservation caused by some miscommunication and over booking. This situation shall not repeat going forward. Thank you for your participation and hope to see you again the next season.